Unfortunately, officials are going to take the opportunity of this MOCA show to make graff artists and writers the scapegoats for the City's woes. It's all about taxation and if you get arrested you will be taxed, believe that! Ask Smear or any of the MTA crew members being sued and trying to be made an example of. The City is bankrupt and more people in jails means more revenue. They've already made it illegal to sell spray paint to minors, now you have to watch out for "vandals" carrying "buckets of grout and pieces of tile". PLEASE!! I guess the day workers outside of Home Depot are now targets as well! It's a slippery slope people. Please stand up and say something. Our youth continue to be criminalized. Let's not put up with this type of selective enforcement anymore. I'll be on Pam Morrison's NPR radio show tomorrow at 1:20pm to discuss further and continue the debate. Authorities say the downtown Los Angeles show has spawned a rash of tagging near the museum. The museum says such 'anarchic' work was anticipated and is being cleaned up. The Museum of Contemporary Art expected to make some waves when it launched "Art in the Streets," billed as the first major U.S. museum survey exhibition on graffiti and street art. But the LAPD said the show has also become a target of taggers who want to leave a mark of their own outside the Little Tokyo exhibition space where the show opened Sunday. In a city considered one of the birthplaces of street art, the exhibit at the Geffen Contemporary at MOCA has intensified an already fierce debate about whether something that is illegal can also have artistic value. To fans, it's a welcome recognition of an urban artist style that is evolving from street vandalism into something more. "It's exciting to have some of the most vibrant street art in the world happening in Los Angeles," Greg Linton, an arts blogger who documents street art in L.A., said of the exhibit. "It's what makes these urban areas so special." But what Linton considers art, some in law enforcement consider urban blight. "The exhibit kind of glorifies graffiti," said Los Angeles County Sheriff's Sgt. Augie Pando, who helps oversee the department's anti-tagging campaign. "It puts taggers on front street." Authorities are concerned that the show is drawing taggers who might be wanted on vandalism charges elsewhere, said Jack Richter, an LAPD senior lead officer. Police have been taking photos of the dozens of pieces of graffiti found around the museum, hoping to eventually link them to specific taggers. Over the last week, authorities say, they have seen a conspicuous increase in graffiti and other forms of vandalism near the museum, including tagging over the weekend at the Little Tokyo Gold Line Station. There is strong evidence that this is not just the work of local taggers. Two French nationals believed to be in Los Angeles for the exhibit were detained Friday after authorities caught them with buckets of grout and pieces of tile near the historic Perez building in Little Tokyo. Richter said authorities believe that one of those detained was the street artist known as Space Invader, who has left mosaic tiles of the vintage video game in cities around the world. The pair were released while the investigation continued, and Richter said officials were checking to see if they had flown back to Paris. After their release, their trademark mosaics were attached to several buildings, including the Geffen Contemporary, he added. "We respect the rights to have an art exhibition, but we demand the security of other people's property," Richter said. "As former Chief [William J.] Bratton was fond of saying, 'if you want to be an artist, buy a canvas.' "
The exhibition traces the development of graffiti and street art from the 1970s "to the global movement, concentrating on key cities such as New York, Los Angeles, San Francisco, London, and Sao Paulo where a unique visual language or attitude has evolved," the MOCA website says. The exhibit features paintings, mixed media sculptures and interactive installations by 50 artists, emphasizing Los Angeles' "role in the evolution of graffiti and street art, with special sections dedicated to seminal local movements such as cholo graffiti and Dogtown skateboard culture." MOCA officials declined to comment about the controversy Monday, except to say they were cleaning up the graffiti as quickly as possible. But in an interview last week, director Jeffrey Deitch said the museum anticipated that "Art in the Street" could bring unwanted graffiti from "some of the young taggers who are anarchic." One of the show's possible intangible benefits, he said, is that taggers now spraying illegally might see the exhibition and raise their sights. "We want to put out an inspirational message: If you harness your talent you can be in a museum someday, make a contribution and a living from it." 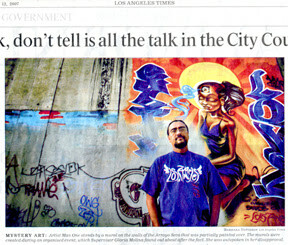 MOCA has been working with Little Tokyo community leaders to deal with the graffiti. In addition to MOCA's agreement to immediately clean up any graffiti, surveillance cameras have been installed in the area. Brian Kito, president of the Little Tokyo Public Safety Assn., said he had definitely seen an uptick in graffiti on buildings around the Geffen Contemporary, including the one that houses his sweets shop. He said he believed the tags were connected to the exhibit and hoped visitors would be respectful of the neighborhood. "We are welcoming people that appreciate street art but we hope they are not inspired to show off their work on the buildings outside," said Kito, who praised MOCA for reaching out to community leaders, previewing the exhibit for them and encouraging them to contact the museum if there were any problems. MOCA is not the first museum to deal with the issue. When the Museum of Contemporary Art San Diego held an exhibition last year that included work by L.A. street artist Shepard Fairey, a tagger vandalized one of Fairey's murals. Museum director Hugh Davies said he was disappointed by the vandalism but accepted it as being part of the street art culture. "There's an anarchic culture that doesn't want to go through the chain of going to art school, [then getting into a] gallery and museum," he said. "It's like, 'I want to do it in my own way, I'm not in it for the market.' "
The street art scene, which has long influenced popular culture, has been slowly entering the mainstream of the art world. There have been shows at major galleries, and street art has become an influential element of the fashion industry. The scene was chronicled in Banksy's Oscar-nominated movie, "Exit Through the Gift Shop," which was set in the world of L.A. street art. Man One, a street artist who runs Crewest gallery in downtown L.A., said that he had not noticed much more tagging around the Geffen Contemporary in recent days and that he thought the police were overreacting. "Law enforcement wants you to believe the broken window theory — that the city falls apart and bigger crimes occur because of an increase in tagging," he said. "One of the questions that the city should be asking is if there is an increase of violence. Have there been more shootings because of this show? Has anyone died because of this show?" "The way I always look at it: Is it done with permission or without permission? That's what it comes down to for me. But either way it can be art," he added. "Not all of it is art, but sometimes there are some beautiful things that go up without permission." Times staff writers Jori Finkel and Mike Boehm contributed to this report. This story came out on the LA Times yesterday and has really bothered me. The LA city attorney has come up with a plan to have injunctions on taggers much like they are doing on gangs in certain areas of LA. This is so against our rights as citizens of this country, I can't believe this guy is serious! Stopping vandalism and enforcing laws is one thing, but not to be able to gather with others who "might be" considered taggers and can lead to arrest? We might as well be in Nazi Germany. Here's the LA Times story..
'Tagging' or just hanging out -- busted either way? -who will distinguish what a tagger looks like? -can he (or she) be white and from the West Side? Or only low income, minority areas will be targeted? -here you are guilty by association, they don't even have to catch you in the act of doing graffiti, just talking about it is enough. Can you say "thought police"? -what if you are photographing graffiti? Are you guilty as well? -in Brazil police shoot to kill at graffiti taggers, tagging hasnt stopped. -harsh punishment already exists for graffiti in LA (its a felony) we don't need more. -so we will begin to throw more kids in the system for non-violent offenses and further burden our already broken system of jails and services? I can go on and on..but please take the time to let your voice be heard and let the city attorney's office know that we won't stand for this kind of short minded way of thinking. *In this economy we need more jobs not jails!